Great for the office or warehouse, this Classic Series garage cabinet provides secure storage for office products and other essentials. Features include four fully adjustable shelves on 2-inch centres, plus a raised bottom shelf, a three point door lock system and three sets of hinges per door. i3 Plus by Bestar has been created to adapt to your living space with the flexibility of its configuration possibilities. Its sleek design is Intelligent, Inspiring and Innovative. Durable commercial grade top surface with melamine finish that resists scratches, stains and wear. It offers two file drawers with letter/legal filing system. Drawers on ball-bearing slides for smooth and quiet operation. One lock secures both drawers. The storage cabinet has one fix shelf covered by frosted glass doors. Meets or exceeds ANSI/BIFMA performance standards. Within a compact space, choosing the right pieces of furniture is crucial in order to feel relaxed and comfortable. Maximize every square foot of your room with Bestar's Small Space units! Durable commercial grade top surface with melamine finish that resists scratches, stains and burns. The top surface is 11= inch deep. 4 adjustable shelves to maximize your options. Assembly Required. Perfect for janitorial use, the Sandusky Freestanding Steel Cabinet offers convenient storage for building maintenance and cleaning supplies such as brooms, mops, bottles and vacuum cleaners. Ample storage space and three fixed half-shelves keep your items organized and easily accessible. This cabinet is supported by durable, 24-gauge welded steel construction and a locking handle (key included) for secure access. The Sandusky Lee janitorial cabinet easily organizes building maintenance and cleaning supplies. Made from durable 24-gauge welded steel, the cabinet features three fixed half shelves and a locking handle for safety. Offers storage for brooms, mops and vacuum cleaners. Classic Series 36 Inch W x 72 Inch H x 18 Inch D Storage Cabinet with Adjustable Shelves in Burgundy Great for the office or warehouse, this Classic Series garage cabinet provides secure storage for office products and other essentials. Features include four fully adjustable shelves on 2-inch centres, plus a raised bottom shelf, a three point door lock system and three sets of hinges per door. 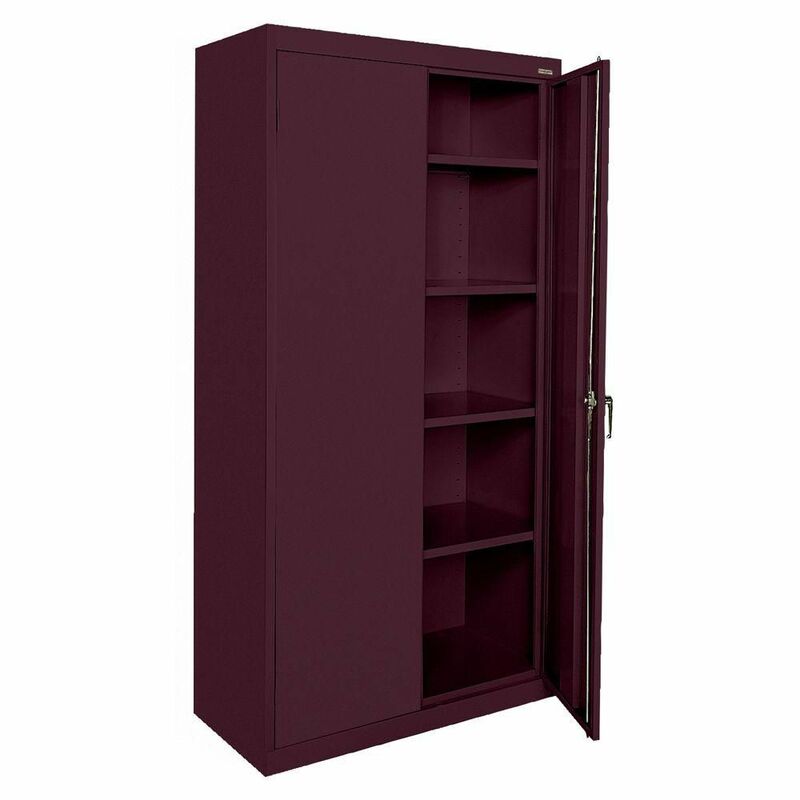 Classic Series 36 Inch W x 72 Inch H x 18 Inch D Storage Cabinet with Adjustable Shelves in Burgundy is rated 4.4 out of 5 by 5. Rated 5 out of 5 by Sue from Very easy to assemble and it was the perfect size for what we needed. Very easy to assemble and it was the perfect size for what we needed. Rated 3 out of 5 by Marie from We did not take possession of the cabinet because... We did not take possession of the cabinet because it was damaged and we returned it. Rated 4 out of 5 by MarkinPDX from Excellent value for the money. Came with five adjustable shelves and we only used four (includin... Excellent value for the money. Came with five adjustable shelves and we only used four (including one as the floor). Unit slightly out of square, but shelves and door fit and operate fine. Will buy two more. Rated 5 out of 5 by RLNARA from A GOOD CABINET MADE FOR ITS MEANT PURPOSE.ARRIVED WITHUT DAMAGE WITH ALL ITS PARTS.MINIMAL ASSEMBLY OF LOCKING PART REQUIRED CAME WITHOUT DAMAGE IN TRANSIT.ALL PARTS AND SCREWS.MINIMAL ASSEMBLY OF LOCKING MECHANISM NEEDED 20 MINUTES TIME.ALTHOUGH MADE OF VERY LIGHT AND FLIMSY STEEL MEETS ITS PURPOSE FOR WHICH IT IS MADE. OVERALL A GOOD PRODUCT FOR ITS PRICE AND PURPOSE. HAPPY.DR. N. M.D.